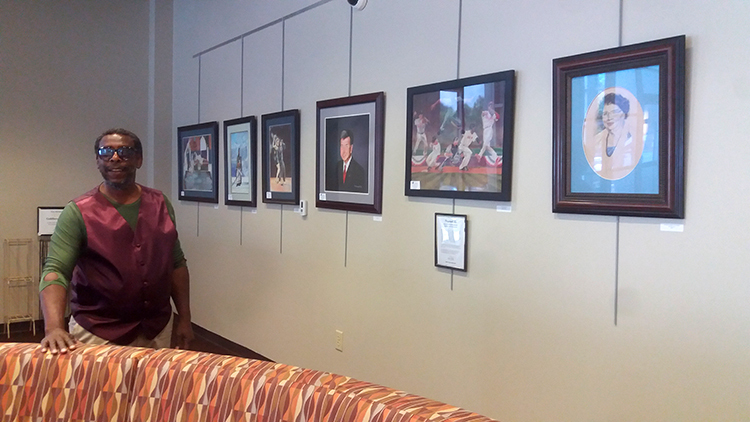 A new exhibition has just been placed on display in the City Gallery at the Municipal Building that features some familiar names – artists who are also employees of various departments of the City of Augusta. Responding to a call for artists published by the Greater Augusta Arts Council, 5 artists submitted samples of their work to be included in the show, which features several types of art – from watercolor to quilting. The goal of the show is to highlight the varied talents of the employees of the City of Augusta, which Christina Berkshire, the Arts Council Administration Manager and gallery programmer, is happy to do. You can read more about these skilled artists on posters hanging alongside their artwork in the City Gallery space, which is located in the lobby of the Municipal Building at 535 Telfair. A reception recognizing the artists in the current show will be held in August, date TBA. For those interested in participating in future exhibitions in the City Gallery, please contact the Greater Augusta Arts Council, 70-826-4702 or Administration Manager Christina Berkshire at Christina@augustaarts.com.